Here you will find information about the village, news about local events and links to local attractions. We hope that you find what you want. If not, please contact one of the Parish Councillors listed in the contact page. Click on a picture to see a larger version. Please note that this site is not responsible for changes to any events listed. The latest edition of the Parish newsletter is available to view. Clicking on one of the pages below will open a larger version in a new window. Please contact Henry on (01760) 755254 for further details. The next Meeting of the Parish Council will be held on Monday 29 April* at 6.30pm in the Village Hall. Everyone welcome. Below you will find Minutes of Parish Council meetings from the last twelve months, plus other documents which the Council has to publicise to comply with the Transparency Code. Click on a heading to see the full document. The glorious summer passed briefly into autumn and then, seemingly, into an early winter. Saturday the 27th started wet and cold, and continued that way up to the start of this year's event. Those involved in the organising and preparations feared that the inclement weather would significantly reduce the attendance, and so were more than pleasantly surprised to see a good crowd gather for the usual fun and frolics. Here's a selection of images from the night. This year's Remembrance Service marking the centenary of the end of World War 1 was led by the Revd. Canon Stuart Nairn and included a dedication of the newly created memorial garden. 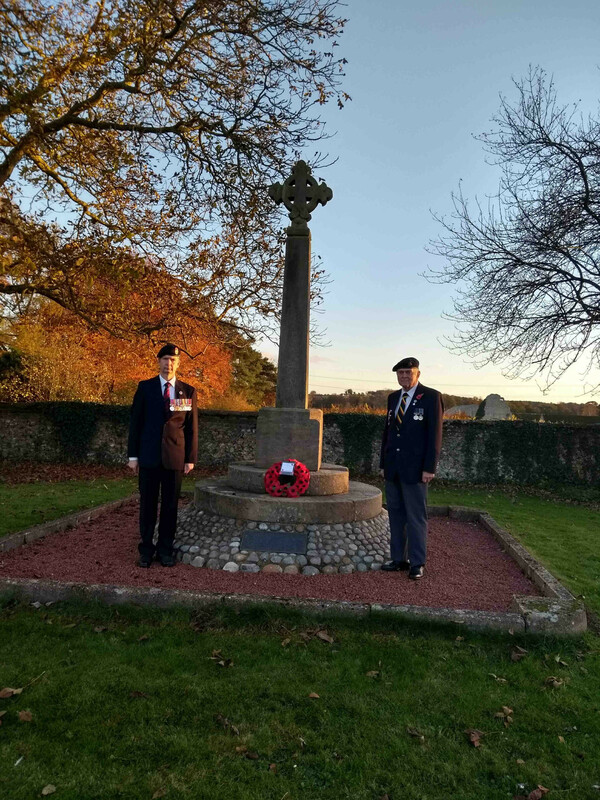 The garden includes plantings of rose and lavender shrubs, and a temporary display of ceramic poppies created in memory of each of the names recorded on the War Memorial and listed below. Last winter volunteers planted 1000 bulbs on the village green. We hope you enjoy these two views, above and right. West Acre resident and Parish Councillor Jeremy Cameron is a compulsive walker. For some reason that is difficult to fathom, he has walked from Quebec to Detroit, New York to California, London to Venice, Hook of Holland to Istanbul. And other equally exotic places. Looking for a new challenge, he decided to visit all forty-five places in England beginning with Q. Jeremy planned on taking two years to complete his quest, but some serious unwanted encounters with SERIOUS illness added another three years to his journeys. Having reached Quaking Houses, the last on his list of Qs, Jeremy started to put pen to paper. The result is Quite Quintessential. Jeremy, pictured right, recently celebrated the launch of his latest book with an event at Jarrolds in Norwich. He traveled there, and back, by car. Wise man.